A highly flexible, excellent sounding and extremely comprehensive unit. Superb sound quality. Extremely comprehensive software controlled low latency monitoring options. Four excellent microphone preamplifiers. The Titan occupies the middle position in a trio of USB interfaces from Prism Sound. The smallest in the range, the Lyra, reviewed in July, and the Titan and its bigger brother, the Atlas, share the same basic architecture and convertors. "The mic pres featured across the range are excellent as they are clean and transparent with plenty of available gain"
As we already know from the Lyra, the conversion quality of the range is just about as good as it gets and certainly maintains the reputation for excellence that Prism Sound have established in their Dream AD and DA products. On top of that, the mic pres featured across the range are excellent as they are clean and transparent with plenty of available gain. The reasoning behind this USB range is flexibility. Pretty much any desktop or laptop has USB 2 or 3 and the Titan will connect to any PC or Mac running Vista or OSX 10.4.11 and up, making it ideal for the studio or as a portable unit. In terms of connectivity there's a lot. 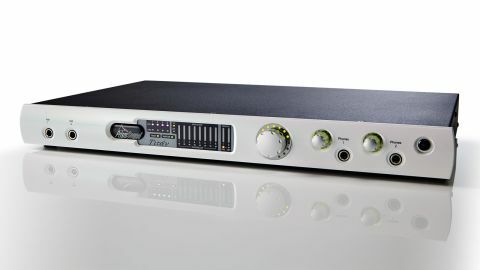 Eight analogue line ins and outs on 1/4-inch TRS jacks, four mic inputs on XLR, S/PDIF I/O on phono plugs and ADAT I/O which can also be configured as TOSLINK plus two front panel 1/4-inch headphone outs. There is also an MDIO expansion slot to incorporate Pro Tools HDX and AES 3 should you need it and intended future developments include Thunderbolt. As you can see from the front panel of the device, the Titan has pretty minimal physical controls, so the first thing that needs to be done is install the software. The control panel app has an upper window where you set sample rate, sync sources and define the additional digital inputs and outputs. Beneath this sits the mixer section controlled by a row of tabs which switch between inputs, outputs and separate mixer pages for pairs of analogue and digital outputs. On the input page the first four channels can be switched between mic, line and instrument, with phantom power selection for mic sources. Each input channel has switchable phase reverse, high-pass filter and the Prism overkiller circuit, which is a soft limiter useful for preventing accidental overloads. Channels 1 and 2 can also be set to an RIAA filter so you can plug a vinyl deck straight in. All channel pairs can also be set to M/S mode for those Mid/Side mic'ing moments. Each channel has a peak meter alongside its fader and these are of a good resolution allow easy setting of levels. The outputs tab allows you to designate the function of pairs of analogue outputs. For example, you might have output 1 and 2 set to DAW, providing the stereo out from your workstation and the other three analogue pairs to mixer. These three pairs can have individual sub mixes of all the inputs (analogue and digital) plus the dedicated DAW return by flicking to their dedicated output pair tab and setting the required balance. It is also possible to set a headphone balance to the dedicated headphone outputs on the front of the unit. As all these mixes are happening out of the DAW software, they are all low latency and therefore perfect for headphones during live recording. The analogue outputs can also be assigned to have level control by the large control knob on the units front panel so it is possible to gang together a pair for stereo monitor control or up to all eight for 7.1 surround. With its highly flexible internal routing and mixing capabilities the Titan is perfectly suited to native systems where low latency monitoring is an issue and, with its multitude of input and output sources, it will suit the demands of most professional musicians. With so many features it is a complex beast but the software control is very intuitive and anyone used to modern DAW software will quickly find their way around it. Clever design that sounds great - who could ask for more?